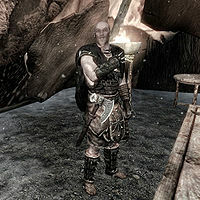 Arrald Frozen-Heart is a Nord soldier and the commander of the Hjaalmarch Stormcloak Camp. If Hjaalmarch is taken by the Stormcloaks, he will relocate to the hold capital, Morthal, where he will spend most of the day in the Jarl's hall directing the war effort, and sleep in the local barracks. He wears a set of Stormcloak officer armor, bracers, and boots. He is equipped with a hunting bow coupled with twelve steel arrows, a steel dagger, and a random iron or steel weapon. This page was last modified on 17 June 2015, at 17:55.